Flanked by two of his detectives, the homicide squad commander, Superintendent Geoff Beresford, arrived at water police headquarters yesterday afternoon. He spent about an hour examining the boats, moored at the headquarters pier since the accident, and then talked to investigating officers. It was an indication of how seriously police are taking the investigation that Superintendent Beresford came personally to talk to officers attached to Strike Force Condor - which is led by the Coronial Investigation Unit with assistance from the water police and central metropolitan region detectives. The coronial unit, attached to the homicide squad, investigates matters expected to end up before the coroner. About an hour before Superintendent Beresford's arrival, Chloe Dickey - the teenager who lost six friends when the 12-metre Jordon's and the boat she was in collided - arrived at the Balmain headquarters for a formal interview. With a brace around her neck and her right arm in a sling, the teary 18-year-old cut a tragic figure when she left the building - her hand over her mouth and large dark glasses covering her eyes. Her mother shielded her from the media with a magazine as they walked away. "The homicide squad commander is here to meet with the strike force detectives [and to] discuss the ongoing investigation," a spokeswoman, Wendy Valois, said. Ms Valois confirmed that police were yet to speak to 31-year-old Matthew Reynolds, who remains in hospital with several broken vertebrae. "One person remains in hospital and will be interviewed when he's deemed medically fit to do so," she said. Police would not be commenting on the particulars of the case until everyone had been interviewed and the case was more advanced, she said. "There is still more investigating to be done." On Saturday, the head of the coronial unit, Detective Inspector David Laidlaw, said police would not rule out criminal charges. The families of victims are bracing themselves for a procession of funerals to be held over the next week-and-a-half. 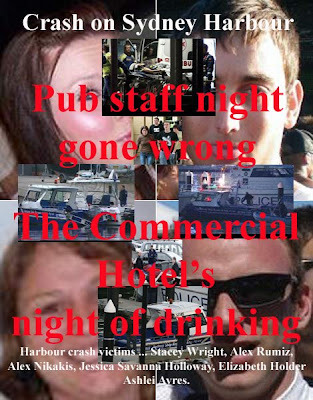 Over the past few days a memorial book has been passed around at the Unity Hall Hotel in Balmain, where one of the dead, 21-year-old Stacey Wright, worked. It was signed by patrons and friends of Ms Wright and will be presented to her family in Wollongong before her funeral this morning. A large contingent from the hotel is expected to travel to the South Coast for the service. Her parents have asked that her friends send a donation to the Breast Cancer Foundation instead of sending flowers. The family of Ashlie Ayres, 32, plan to bury her on the North Coast, while the body of Jessica Holloway, a 25-year-old American youth worker, will be repatriated to the US. Thursday's tragedy came 13 months after four people died when a HarbourCat hit the pleasure boat Merinda on the harbour. The crash was blamed on human error and lack of navigation lights aboard the Merinda. Last financial year, there were 23 fatalities on waterways in NSW, the highest number since records began in 1992.